I have officially fell in love with the Russian countryside. We are sitting here in our camp this evening and got to watch a Russian Vaquero bring in about 30-35 head of horses, they came trotting in right above our camp site by the creek. Missed us by maybe 10 feet at the most. All belled, and sounding just marvelous, but 2 of the horses where wearing front foot hobbles, and nobody even bothered to remove them, just brought them in and trained those two a good lesson on how to travel with hobbles. We are nearing the bottom of a canyon right where we are camped, but just 5mile back up the canyon, we both came to a halt as we decended thi gravel road. The bells Pine said…..and not sure what he had said, I asked him if he was hearing bells…….why yes he said, but from where. We mounted up and pedalled on somemore, and around the next bend, there were about 150 head of Simmental cross cows all belled with different sized bells……….my God what a magical sound all those cows and bells made.We made a choice back at the main road to take a turn and try a few secondary roads. We headed strait out into 1940, I mean folks. The road turns to mostly non maintained gravel, which changes our riding pace considerably. The biggest change is in regards to what a small village looks like along a main road, as compared to just going a few dozen miles to iether side of it. Almost all houses are log, beautiful rustic aged wood color with gaily painted trim boards around all windows and doors. All windows are vertical 4 pane style, and EVERY window is adorned by those iconic Russian pattern lace curtains in stark white. Looks great. These folks garden, OMG, but do they ever garden. The gardens are the yard…….all of it. Out buildings are wood, no paint, and usually the doors are falling off if there ever were any. 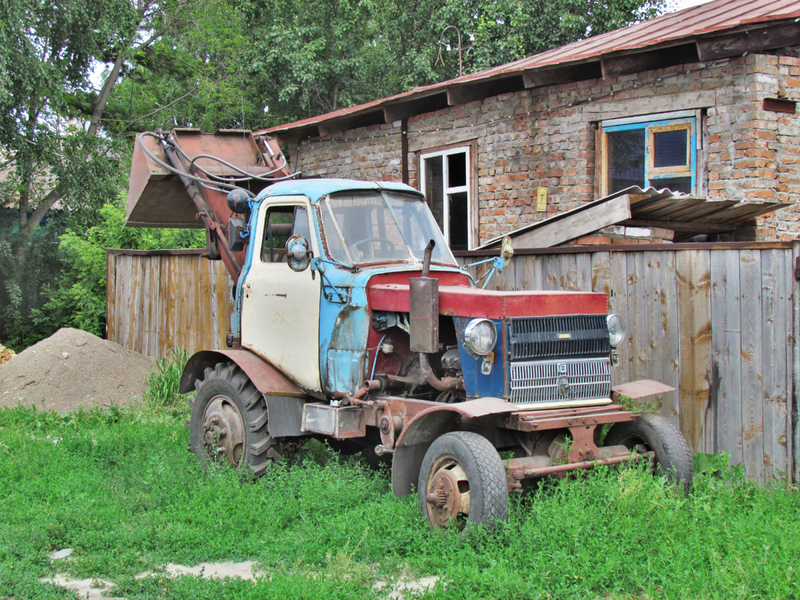 The typical family car is a Lada sedan, and if you owned one I gaurantee you would sooner have a toothache than that car. 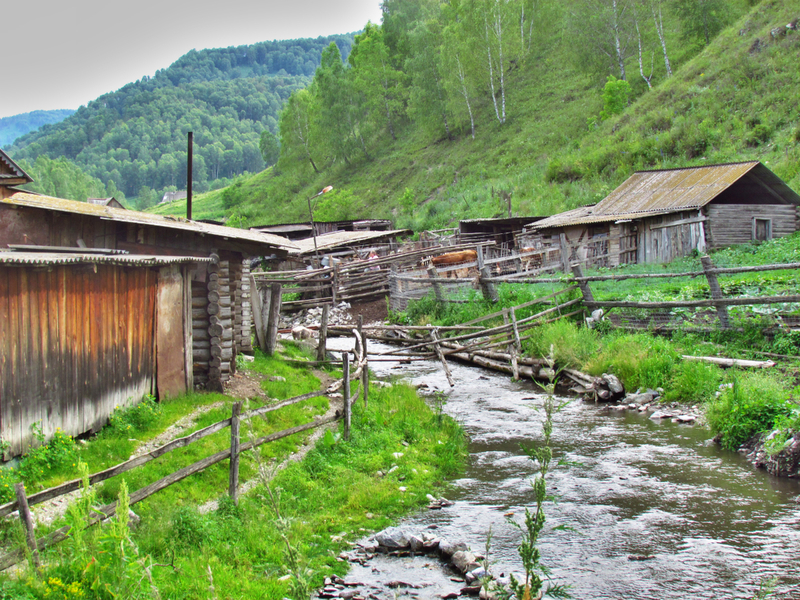 A village, can be a scattering of 3-4 houses, most usually along a creek. 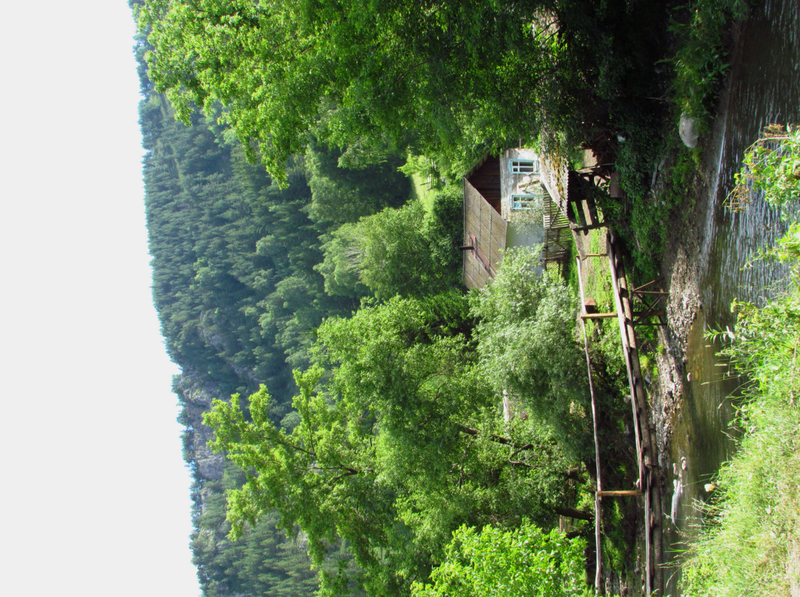 Or a village can comprise 30-40 houses along a creek. Fruit trees in every yard, loose pigs, cattle and goats roam the yards at will. There is clearly poverty out here when you leave the main roads, not so very much different than back home I guess.Its hard to desribe how quaint and beautiful these back roads and villages are. One of those……you have to be here to really appreciate it. 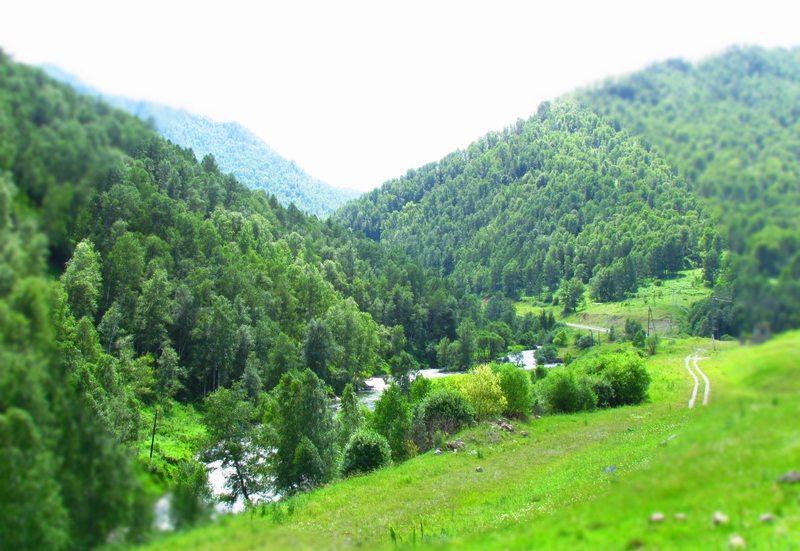 Huge valleys with an abundance of green grass and wild running rivers is pretty hard to beat at the best of times. But dot that lanscape beat with rustic log houses, feeply tilled gardens and a sow and her piglets laying in the shade of a front porch or wall of the house, makes for an interesting ride. Kids sitting in innertubes, playing in the creek, tail swishing cows are thier audience. Herds of horses, mares and colts are everywhere, even rode by groups xtanding on the gravel roads thier colts are sound asleep stretched out on the road. The same scene was repeated often with small bands of sheep all sleeping on the road. Old men walking thru towns to visit friends in other log homes. Old women, repleat with a paisley (Pinny or Apron) and the ever present babooshka over thier heads, are out working the garden or picking what the gardenhas brought forth. Late after noons finds good friends sitting under the shade of a tree, or sitting on a creek bank fishing or just visting. Its a quiet almost idyllic life, if it werent for poverty and the lack of opportunity that comes with it. There is one real difference for Pine and I as it regards travel and suggestions. 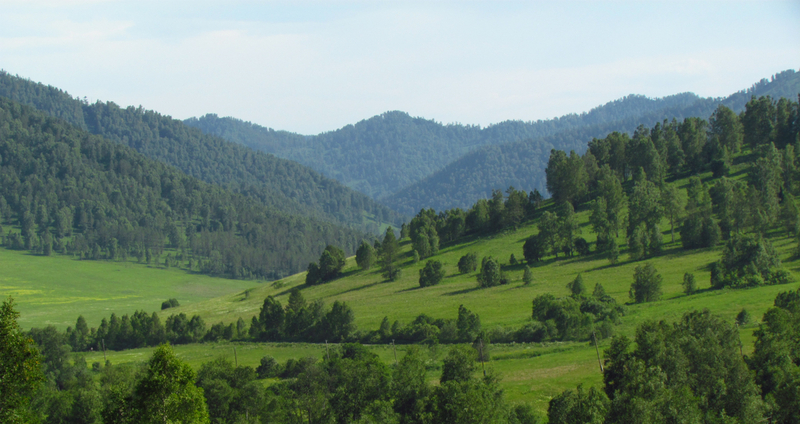 We would both return to Russia, no doubt about it the Alta Krai region is outstanding…….its beautiful , cleaner by far, and we find that the people are very helpful and friendly. For both of us, if we won the Powerball jackpot for millions……….but had to pick up the prize money in Mongolia………ah…,thanks but we will pass and try winning another time. Bout sums it up, we have an agreement so that we quit badmouthing Mongolia. Whoever mentions Mongolia has to buy the other guy an ice-cream bar………dang, I lost 13 times one day. We made a stop in a small town and hey wouldn,t you know it, but 2 other cyclists came along. 2 guys, friends, from Spain. They have been on the road now over 2 years, logged 48,000 kilometers to date, and have 2 continents left on thier journey to round the world on every continent. Real nice guys……but dumb as a post I suspect. Both worked as professionals, saving towards this dream, and they made it and have enjoyed every mile so far. Not long after we met a cycling couple from Switzerland. Also proffessionals who wanted to take a break from the race of rats. They had been on the road since March 1st, and plan on being gone approx. 10 months and want to end in New Zealand. We find that we are just 2 more souls, with an intention of cycling around the beautiful world that God created for us. We know both our purpose and our place on this earth, because we have a singular relationship with its Creator.The further north we head, the wilder the driving gets, and the busier the roads. Some roads just flat dont feel good nor safe. We often ride the gravel shoulders just for pure safety of it all. Driving here leaves alot to be desired, which we had been warned about, and our 4 most recent cyclist friends made a point of reiterating as well. The countryside flattens out a lot, rolling like central Kansas, and grain as far as the eyes can see. Its also a lot hotternow, we have had 2 days over 113, and high humidity. So for me the cycling is tougher. Got a little heat stroked or food poisoning ?????? ?not sure which, had to sit out a day to try and recover. Got one hand covering each orifice……would love to have a third to scratch mosquito bites. We are sitting in Novisibirsk as of 4.15 pm today. Taking suggestions from fellow travellers about our route after this. We are sitting on what has been called Mosquito Ridge or Road, depends on where you are from. Dasvedania Vladimir, we are headed your way. Have had the feeling that we should have outfitted you with something that most cyclists don’t carry as standard equipment: long motas (AKA Shu-flies). They are also good for hailing taxis in big cities, I am told. Have lost track of you of late. Hey ben good to hear from you. We are fine, and safe. Loved russia a whole lot. Back on the bikes cycling thru ukraine which is just great. Small roads and villages, really nice people. All is well, do say hi to everyone for us. Hello sandy and john, glad your well and enjoyed you cycle tour. We reallu enjoyed russiz, never thought i would be saying that… but its true. Now cycling thru ukraine and jit is great. Say hi to all for us. Hey kent, who ever said guys like us arent tech whizzes was wrong. Had a great time in russia, really liked it. Now in ukraine and loving it as well. Hi marion, thanks for tagging along. We enjoyed russia a lot, the people, villages al of it. 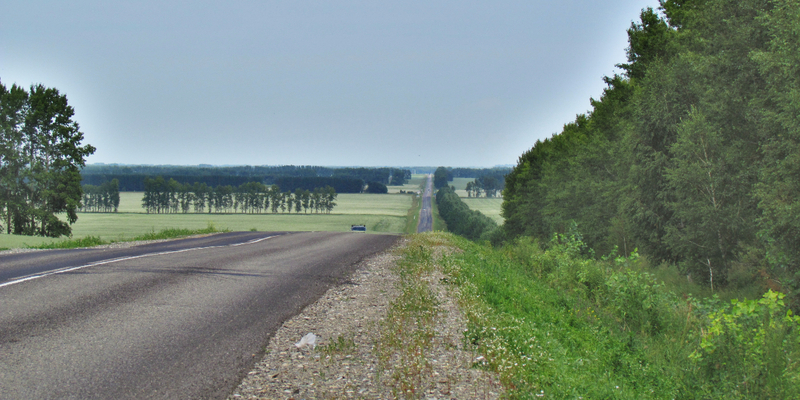 Now riding thru ukraine, love it as well, headed for moldova. I finally figured out how to leave a message. this is the most amazing adventure i am so jealous, wish i could do what you are doing with your son. I’m praying for you, hope your health holds out to finish the trip. I enjoy reading each post, keep it up, and the pictures are awesome. Hello Jeremiah and Pine. Love keeping up with your travels through this blog. We are thinking of you and praying for your safety and well being everyday. John and I just returned from our motorbike trip in Colorado and when we rode up the Monument both of us were thinking of you and times gone by. One of our biking buddies is riding his “bicycle” from Vancouver to Winnipeg in August and tenting along the way. He is excited to get on the road so we forwarded your blog to him so that he could enjoy your experiences while he awaits his departure. Hope you are feeling better, the pictures are beautiful. Be Safe, love you both. I enjoyed the bitumen comment thrown in for us ozzys. Have you seen anything to jiggle your creative bone and are looking forward to getting home and trying. Stay safe and try not running into Putin on your bike, I don’t think you folk are on his popular side. Dad your scene of bringing in the horses was quite alot different than mine haha! Mine had a bit more dust and sage but none the less a cool sight! Love you so glad to talk to you both this morning!! Really enjoy following along on your adventure!! Safe travels! Gettin better Mom, trying to make some hard choices about directions and distances. Will talk later if we can. The 4G quits about 38 feet past city limits most places. E service in small towns at best. H for the Prayers that I know you send to heaven for me. Hi Erin, we are glad you are along with us for the journey. And, thanks for the advice medically, still not sure, but it may have been both at one time. Heatstroke and some sort of bad food bug. Pretty sure not water born, we have been pretty diligent on that account. Getting better, just a few kingering side effects we shall not discuss here. Keep posting,follwing, and as we can we will answer. Hey Bill, hows that egraving practise coming along? Hate for my blog to hold up your progress. 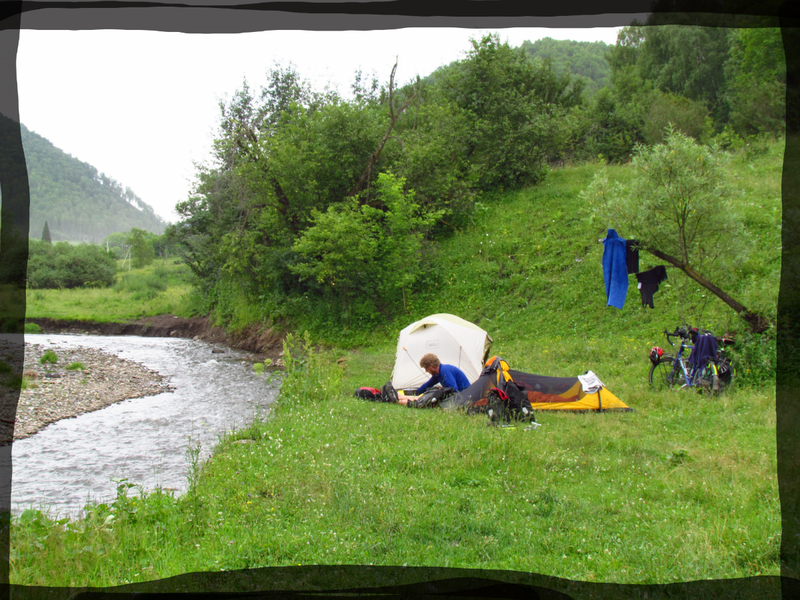 Now, being your a mountain bike fan, consider south east Russia. Plenty of small back roads, and even more dirt trails than roads all along the Chuksky trakt. We will be in Romania sometime August, I have talked to many who say that is where the best mtb riding is???? I will let you know. Thanks for being with us. Hey Stewart, thanks for being along with us, we appreciate the thoughts and prayers. Have. To say, as a father it is a great time with my son, Mom and I have been blessed with a fine young man. Love the Russian countryside, outstanding grass, they those yearlings further to the east I think, but hey, what the heck would I know. Big wagon country. Glad to have you along, say hi to mutual friends for me. Hey terry, glad yer well, thought you would be well aquainted with Shakshuka being in Israel and all? Still lookin for a good flat bread recipe from is/arab direction if you know one, but not pita. Cooler here now as well, plenty of rain. Feeling much better, but the diarhea well not so nice. Will heal as soon as the Lord thinks it is my time. Glad yuor along. How is that engraving coming, hope you bought a plain bike co you have something to engrave on. I was glad to see a new post. I thought maybe you had gotten a tour of Siberia or something. I tried your recipe for Shakskua, not bad, but I am sure it was better after weeks of grey soup. As nice as the country side looks, and the people seem interesting, I sure feel blessed to have been born and raised in the United States. Where there has been nothing but opportunity. Everywhere you have been looks pretty depressed with a lot of poverty. Hope you are feeling better and can “shade up” like the cows do for part of the hot days. Been praying for you two the whole trip as well as for the home front. Colleen posted something about your blog today on FB so I looked it up and spent the past couple hours catching up. I reckon you have done more to truly live life than anyone I’ve ever been around. Best of luck to you and Pine. Now that I know about the blog, I’ll be following along from the safety of my living room! Keep on truckin amigo!!! Holy Cow that country your in now looks like the polar opposite of where you came from in Mongolia! It looks beautiful there in Russia and the roads look good but that doesn’t take into account the bad drivers. That part of it sounds pretty dicey be careful out there. The food situation must’ve improved a lot if you have access to ice cream bars, that’s livin’ in style! I sure am enjoying following along on this adventure, keep the posts coming! Looks like a beautiful trip through Russia so far! Although Mongolia made for interesting reading, the countryside photos were a little bleak… the photos of the people however – phenominal! Would love to see some pics of the people you are meeting along the way in Russia! Sure hope you feel better soon… be careful with the sun/heat as sunstroke can happen again quite quickly after you’ve had it once. Enjoy reading your great adventure. Grace and peace to you and Pine. Just a great adventure! Pray for you both daily.